Dough is tricky, mischievous, and loves attention. It requires all your time, effort and love. I would even go as far as to call it needy and slightly revengeful, but I love it anyways. If I could give you only one advice for successful baking, it would be to spare some time to enjoy the process. Don’t start making dough when you have errands to run, when your mind is busy and wondering, when you are in bad mood, because dough can feel it. Once you start rushing, it will crumble in places where it shouldn’t, it will stick to your hands when it is supposed to be perfectly smooth, it will refuse to proof – all in all it will behave like a naughty child: whatever you want it to do, the dough will do the opposite. On the other hand, if you give dough your undivided attention it will pay back with incredible outcome. Free you schedule and your mind, switch on some good music or a favorite movie and embrace the fact that for next several hours you are going to be fully devoted to dough. Holiday baking in particular is a process that should set the mood and bring you to your happy place. So why rush through that? I love watching old Soviet comedies when I am baking. Even though I watched some of them a dozen times and know every line by heart. Here’s the deal with all the cookies in this post: it’s pretty hard to track where they come from. Among the most popular answers are Switzerland, Germany and Austria. But they are also popular in Czech Republic, Hungary and Slovakia. Whatever the case, these babies are delicious – no argument about that! At this moment I am very happy that I have a blog and not a podcast because I wouldn’t dare to pronounce this name out loud. Although, the translation sounds very romantic – “vanilla crescent”. 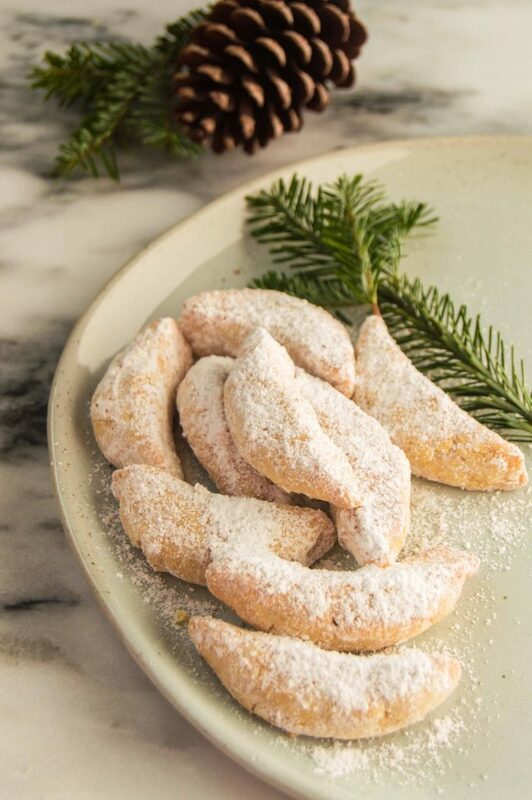 Most people agree that Vanillekipferl originates from Austria, but is equally popular in Switzerland, Germany, Romania and Slovakia. The recipe below is my compilation of different versions of this cookie around the web. The recipe I started with had a mistake so I had to adapt and change proportions on the go. 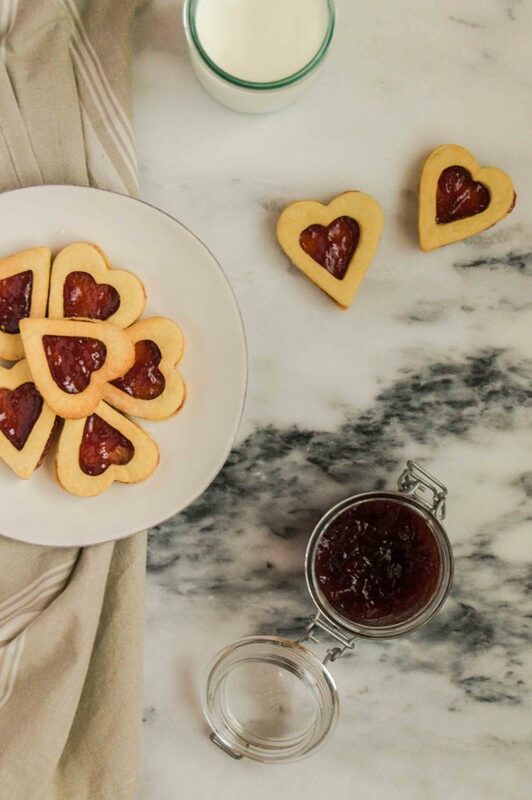 The two ingredients that give this cookie its distinct flavor are vanilla sugar and almond flour. If you can’t find vanilla sugar in the grocery store, prepare it yourself (check out this blog post to see how). Grinding almonds yourself is an option but it can be difficult to get very fine texture – tested by yours truly – so I would recommend almond flour. All the ingredients for dough should be cold. Whenever you are not working with dough – keep it refrigerated. If you are working with a part of dough, once again, keep the rest refrigerated. I can’t stress this enough. 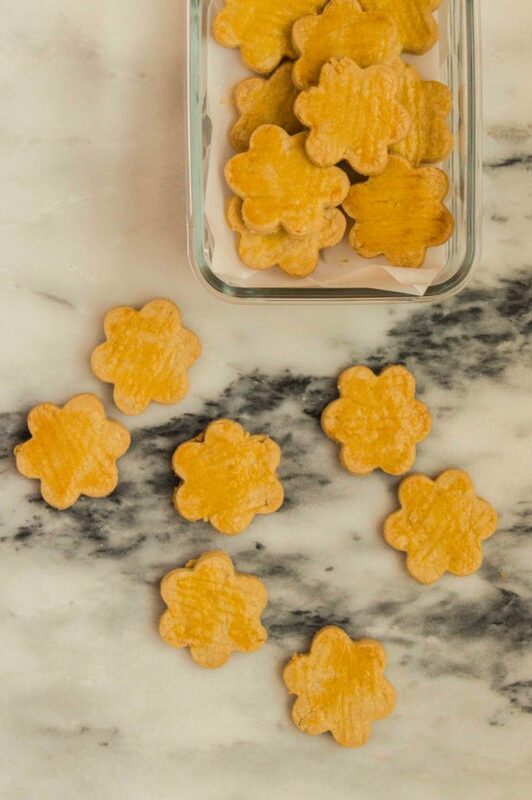 If this simple step is overlooked, the butter in the dough will start melting and you will get a mess instead of cookies. Even the heat from your hands is enough to make the butter melt. When you portion the dough and shape it into cookies they might seem really small and you might doubt whether the recipe is correct – at least, I did. Believe me, the recipe is correct and the cookies are normal. I feel like two years in USA completely changed my perception of what is normal size. The good news: I can pronounce this name. The bad news: I can’t pronounce it without laughing out loud. Spitzbuben! This one is a Swiss cookie beloved by people in Germany, Austria and Czech Republic. 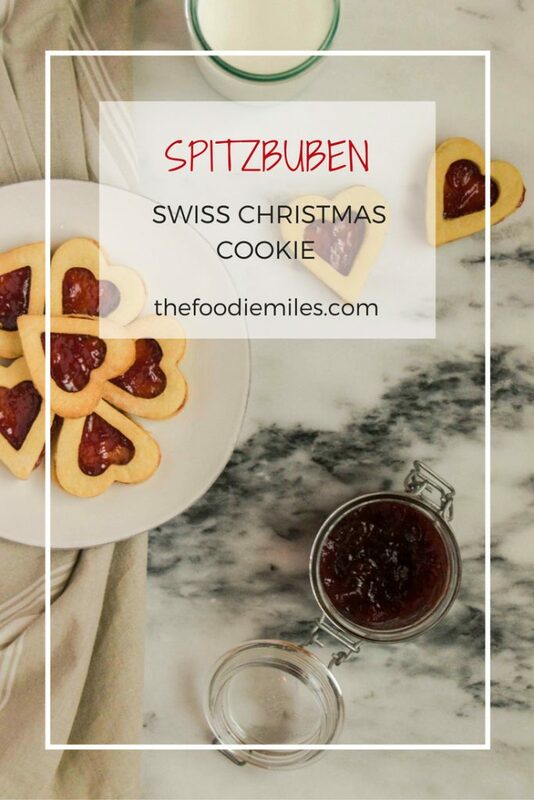 Spitzbuben is a cookie sandwich with jam in the middle. The top part has a hole so you can see the layer of jam. Originally the round cookie had 3 holes filled with jam so it looked like a face of a cheeky boy. 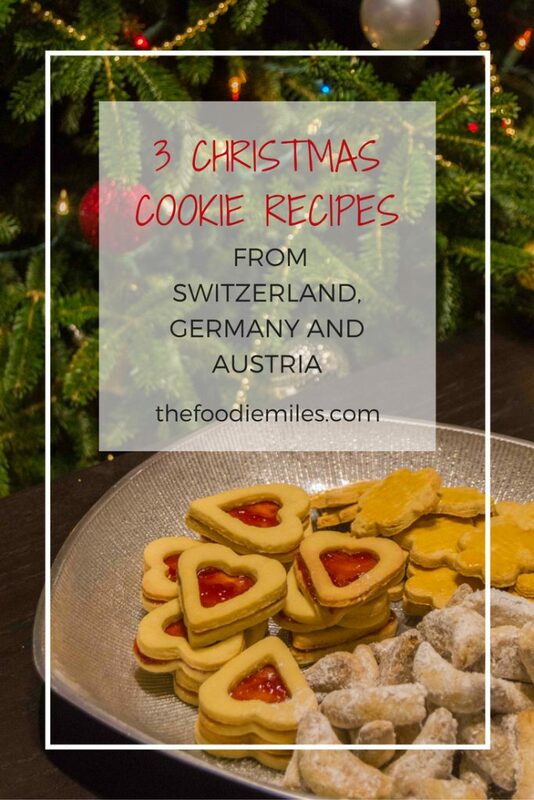 This recipe is from the blog of Robin M. Anderson who found it in “Swiss Cookies : Biscuits for Christmas and All Year Round” book written by Andrew Rushton and Katalin Fekete. I made mine heart-shaped instead of round-shaped, it’s cuter and I didn’t have a round cookie-cutter. You will have a lot of dough scraps. You can mix them together and roll once again. But every time you roll the dough from scraps the cookies will get harder. My favorite out of the tree, mailaenderli looks simple, pale and not particularly attractive. Going through the pictures on google I was hesitating whether it’s worth the time and effort. Boy, was I mistaken about this cookie! Its buttery taste stole my heart forever. 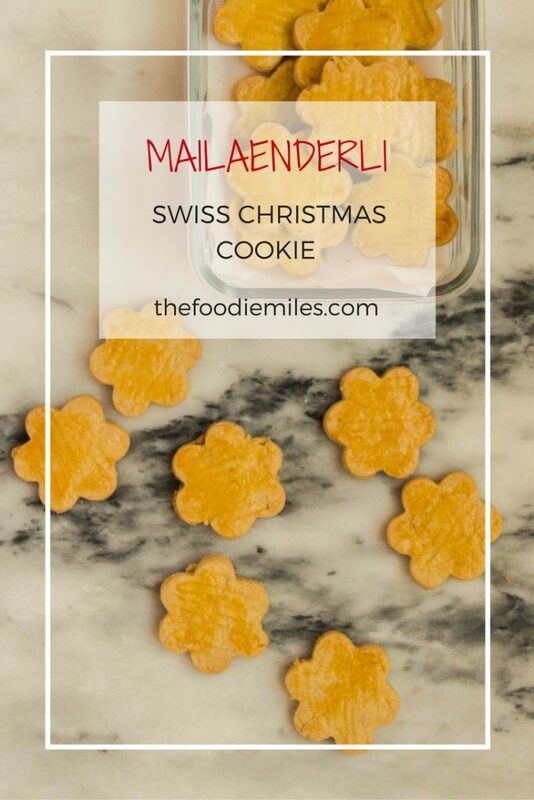 The recipe originates in Switzerland and the literal translation of the name is “little Milanesi”. That’s as much information as I could find. This particular recipe is from the blog My Kugelhopf by Kerrin Rousset, a food and travel writer from New York who lives in Switzerland now. 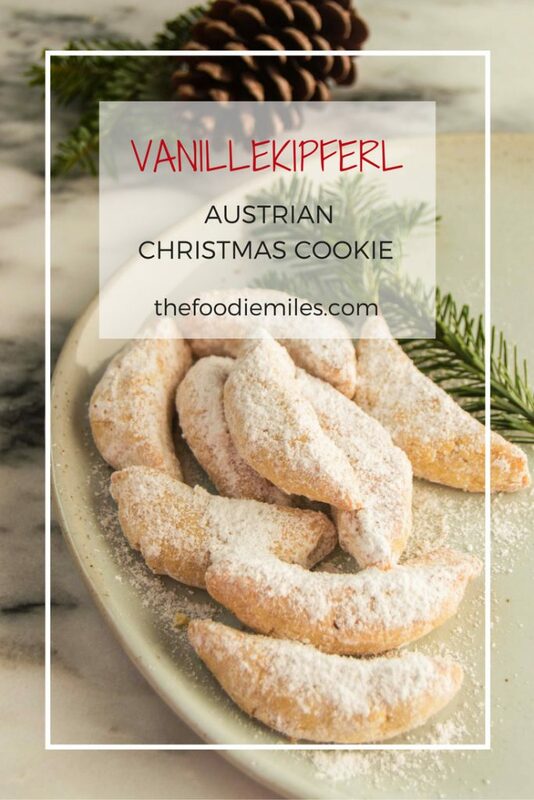 In conclusion, I would like to add that having never tried these cookies in Switzerland, Austria or Germany, I cannot vouch how close mine are to originals, but I hope to get a chance and try some vanillekipferl or mailaenderli at European Christmas markets in the near future. That is if I finally learn how to pronounce the names.